145:3.8 A voice from the front yard exclaimed: "Master, speak the word, restore our health, heal our diseases, and save our souls. " No sooner had these words been uttered than a vast retinue of seraphim, physical controllers, Life Carriers, and midwayers, such as always attended this incarnated Creator of a universe, made themselves ready to act with creative power should their Sovereign give the signal. This was one of those moments in the earth career of Jesus in which divine wisdom and human compassion were so interlocked in the judgment of the Son of Man that he sought refuge in appeal to his Father's will. 145:3.9 When Peter implored the Master to heed their cry for help, Jesus, looking down upon the afflicted throng, answered: "I have come into the world to reveal the Father and establish his kingdom. For this purpose have I lived my life to this hour. If, therefore, it should be the will of Him who sent me and not inconsistent with my dedication to the proclamation of the gospel of the kingdom of heaven, I would desire to see my children made whole-and-" but the further words of Jesus were lost in the tumult. 145:3.11 But of all the beings who were astonished at this sudden and unexpected outbreak of supernatural healing, Jesus was the most surprised. In a moment when his human interests and sympathies were focused upon the scene of suffering and affliction there spread out before him, he neglected to bear in his human mind the admonitory warnings of his Personalized Adjuster regarding the impossibility of limiting the time element of the creator prerogatives of a Creator Son under certain conditions and in certain circumstances. Jesus desired to see these suffering mortals made whole if his Father's will would not thereby be violated. The Personalized Adjuster of Jesus instantly ruled that such an act of creative energy at that time would not transgress the will of the Paradise Father, and by such a decision-in view of Jesus' preceding _expression of healing desire-the creative act was. What a Creator Son desires and his Father wills IS. 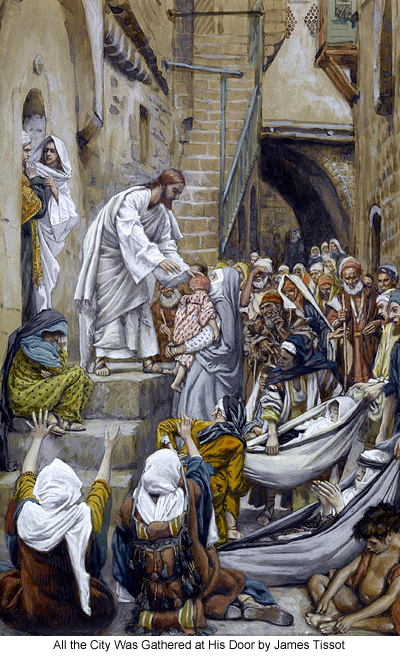 Not in all of Jesus' subsequent earth life did another such en masse physical healing of mortals take place.